Process diagrams allow project mangers to track what happens during a process. Documenting the process objectively allows teams to analyze the steps for bottlenecks and obstacles. Then, they can make improvements so the team functions more effectively. The process diagram typically establishes the rules and guidelines for efficient performance. Project teams use process diagrams to communicate troubleshooting procedures, prevent future problems and ensure consistent handling. 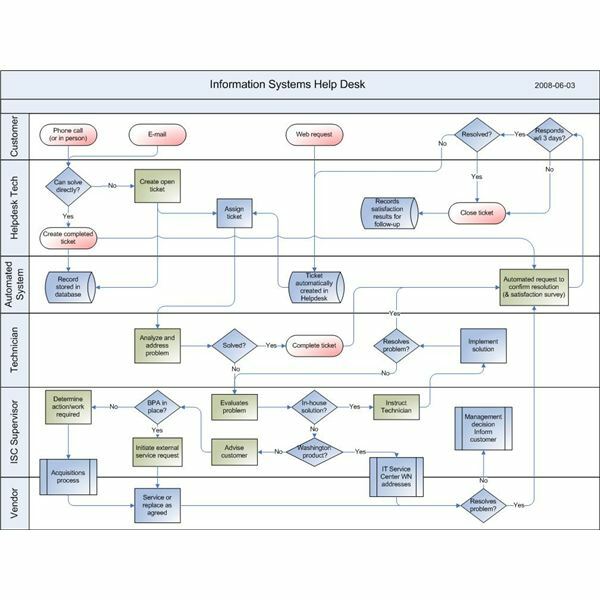 Business professionals use process diagrams for their software help desk functions to list the activities required to solve customer issues, visually represent the decisions that need to be made to resolve a problem and establish a reliable strategy for solving complex, frequently recurring errors. Documenting process steps ensures that all personnel, particularly in global companies, follow the same procedures. Providing a consistent customer experience enable higher satisfaction, lower costs and improved operational efficiency. By generating process diagrams in a swim lane format, you can show the responsibilities associated with each person involved, including the customer and any additional resources required to resolve the problem. To create a software help desk process diagram, begin at the receipt of the problem. Draw a circle, a flowchart symbol to depict the connection from the customer to the customer service representative. Possible ways to contact the software help desk usually include telephone, email, chat or instant message. Next, draw a diamond flowchart symbol. This flowchart symbol represents a decision point. At this point, the customer service representative assesses the information from the customer to decide if he has enough detail to solve the problem. If he does, draw a line to indicate the flow to the resolution step. Then, draw a rectangle to denote the process step of solving the problem. Finally, draw a circle to indicate a connection back to the customer. Again, the possible ways of responding usually include telephone, email, chat or instant message. To show what happens if the customer service representative does not have enough information to resolve the problem, draw a line with an arrow to indicate the flow direction and then a rectangle for the next process step. The next step is to attempt to identify and reproduce the problem. According to the Consortium for Service Innovation, effective teams in both internal and external software support organizations report improvements in incident resolution when personnel keep detailed records about troubleshooting techniques. Effective software support personnel who search a database of previous cases to identify the problem tend to solve cases faster. This improves the “time to resolution" and “first contact resolution" rates as well as increases satisfaction levels for both support personnel and customers. To indicate the next step, draw a diamond. This decision point involves assessing if the problem can now be resolved with the available information or if more research is required. Effective customer service representatives consider all known information before making a recommendation. Software problems can be extremely complex and dependent on certain conditions, such as operating system version, browser or Internet connectivity. Use a callout symbol to add comments to the process diagram. Callout symbols depict a narrative, such as common customer complaints or customer service representative tips for using additional tools that help test and resolve the problem more efficiently. Many software problems must be resolved by installing an update or patch to the existing software. The next step in a software help desk process diagram involves testing the solution. Draw a line from the diamond and then draw a rectangle to indicate the process step. Testing alternatives usually includes talking with the customer and asking him to try out options. Customer service representatives must have easy access to details about how to direct customers to any applicable software updates and make arrangements for an additional call to determine if the software update worked. If no solution exists, draw a line and then draw a rectangle represented vertically. This depicts a document. This step represents the need to create a document for a change to the software, escalation for further research or other approved action, such as replacing the customer’s product to ensure satisfaction. Completing a process diagram includes specifying the termination point, typically an oblong flowchart shape. Use a circle to indicate the connection back to the customer. By documenting the resolution clearly, future cases can be handled more efficiently. Additionally, using the process diagram for training for customer service representatives typically expedites the “time to proficiency" rates for new personnel. Creating a comprehensive process diagram for troubleshooting different problems encountered by a software help desk ensures that all personnel know how to handle difficult situations. Additionally, as customers report problems, feedback on usage can be sent back to the product development teams for analysis and resolution in the next release. "Consortium for Service Innovation Home." Consortium for Service Innovation Home. https://www.serviceinnovation.org (accessed July 22, 2011). Harmon, Paul. Business process change a guide for business managers and BPM and six sigma professionals. 2nd ed. Amsterdam: Elsevier/Morgan Kaufmann Publishers, 2007.